Monuments are different. 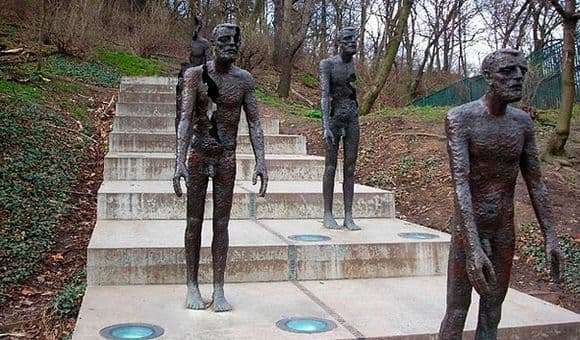 Some may cause laughter, others bewilderment, third anger, fourth indifference and surprise, but there are those that can be called “strong.” One of these cultural monuments are the victims of communism in Prague. The monument very clearly represents how the system, which was in the country for half a century from 1948 to 1989, could negatively reflect on the lives of the inhabitants of the country. During these brutal years, thousands of people were arrested, many of them died or were killed for trying to escape from prison. Of course, such fear remained in the hearts of people. Therefore, in order to perpetuate the great event, when the communist system ceased to exist (12 years after the end), this monument was built in 2002. It depicts the figures of men who descend the stairs. They are as if dead, and with each step the figures are more and more destroyed. And this is not the reason for some kind of cataclysm – this is the idea of ​​the authors: a Czech sculptor and architects. This monument symbolizes pain and loss, rigidity, which was happening at that time with people. But, like many monuments around the world, this sculpture also found its supporters and those who did not accept such a cultural object. One of the outraged opinions is the absence of women in sculpture, and they suffered as well. But the plaque to the monument explains that the monument was built both for the sake of the memory of the victims and for the sake of all those to whom the communist system hurt and ruined life. Also one of the monuments suffered when there were explosions. Now you can often see the flowers that people with great emotions bring to this place. One thing is certain, that this cultural object will not leave anyone indifferent. Looking at these unfortunate people, descending from non-existence, it becomes depressing in their hearts. After all, our lives sometimes depend on the opinion of the authorities, which may not be considered with us.